Friday nights can be so hard. Any meagerly worthwhile restaurant is certain to be packed. And what’s left simply isn’t that great. This past Friday night, we intended to go to Toloache, a renowned Mexican restaurant, on 50th Street. It was five to seven, and the place was already hopping. Every table was filled. I had made a reservation for later that evening, with the hopes that they would seat us early (a bit of gaming of the reservation system, yes). No dice. We stood around the bar area for about 10 minutes before I decided we should jump ship. To Ninth Avenue, we trekked, and popped in one subpar Mexican place after another to see if they had any tables open. “It’ll be about 15 minutes,” we were told, and I wasn’t having any of it. We stumbled upon Hummus Kitchen, and I asked MDP if anything on their menu looked good. He gave a tentative nod, and we went in. The first thing that struck me about Hummus Kitchen was the smell of the place. It reminded me of Petco. MDP said it’s the nature of the food they serve; that is, a bit musty. I wasn’t so sure about his assessment, and found myself distracted by the kibble odor that permeated the air. But I pushed aside my misgivings and dove into the menu. Hummus figures prominently across the board, with options for appetizer and entrees. 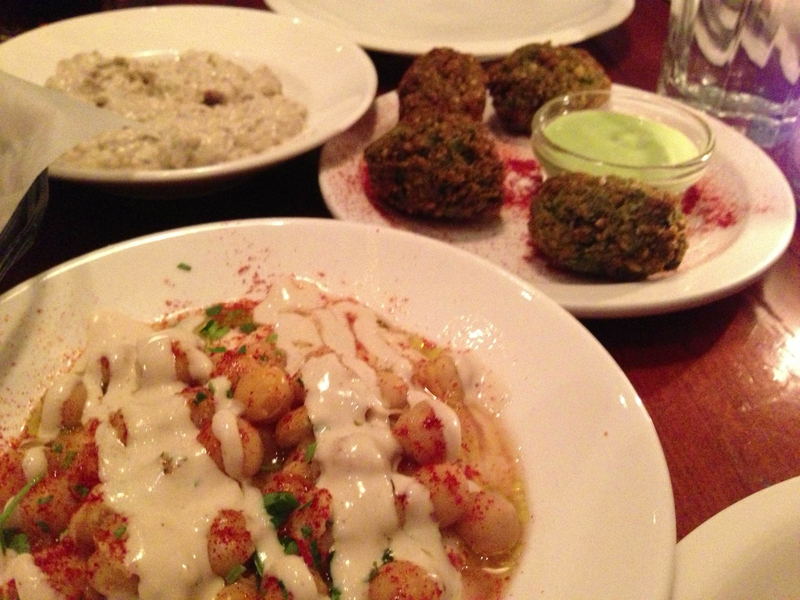 We decided to try the “mazze trio” with falafel, babaganoush and, of course, hummus. MDP wasn’t fond of the green-tinged innards of the falafel. “I’ve noticed that I don’t like the green falafel,” he told me. I thought it was okay, and its dipping sauce was fairly tasty, but I especially favored the smoky babaganoush. It was superb. If you’re going to try any one mazze at Hummus Kitchen, cast aside the hummus for the babaganoush. That’s not to say the hummus was bad. No, it was fine, but the babaganoush is exceptional. For my entree, I ordered the chicken kebab, which came with couscous and an array of chick peas, potatoes and other vegetables strewn around the plate. The chicken itself was fantastic, so tender and flavorful. 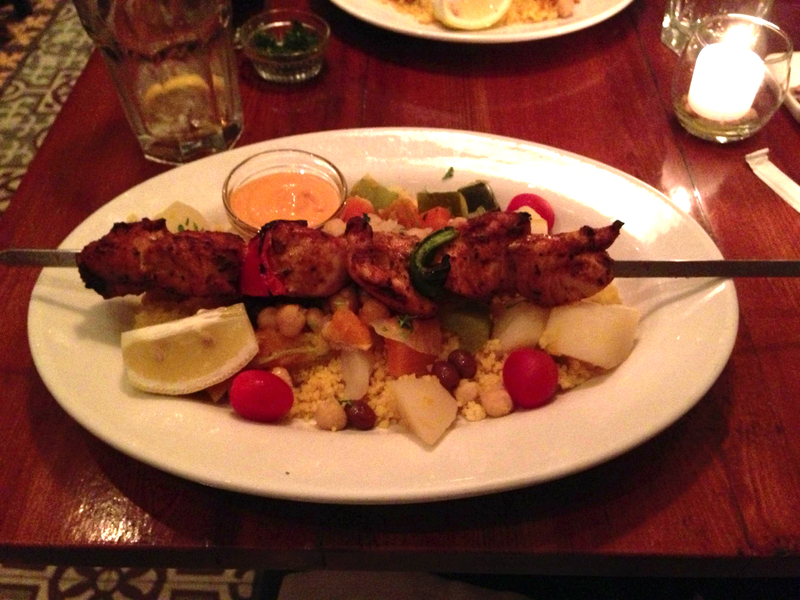 And I loved the saffron-colored couscous that lay like a bed for the vegetables to rest upon. I was quite pleased with my dish. MDP opted for the Chraime Moroccan fish. He said it tasted just like broiled fish, and not much else. His dish came with couscous also, and he finished it all, so it must have been decent enough. Whenever we go to any Middle Eastern restaurant, we must try the baklava for dessert, so we did at Hummus Kitchen. Drenched in honey, the baklava was split into two triangular halves, with much of the pistachio and walnut filling dominating the dish. It was acceptable, but nothing like Wafa’s, which is the end-all and be-all of baklava in my book. So, if you’re in a bind for a Friday night meal and you happen to be in Hell’s Kitchen, you might want to try Hummus Kitchen. I wouldn’t recommend it as a destination dinner place, however. Take the C/E to 50th Street and walk west to Ninth Avenue. Walk north for a block and a half.